UPDATE: 14 April 2019 - Mud is all around steer clear. Remember: April showers bring May flowers ... and mud. The Grafton Land Trust welcomes you to use our many beautiful trails. We are pleased that you are able to enjoy hiking, mountain biking, and horseback riding on our properties, town-owned land, and Conservation Restricted properties. When spring arrives, the freezing protection of ice and snow retreat and the rain combines with the soft ground to form MUD. Because of this, we ask that you refrain from riding, or even walking on muddy sections of the trails. The erosion caused by trail traffic during the mud season causes irreparable damage, creating ruts and permanently exposing rocks and roots. Please be patient and responsible and allow the trails to dry and harden before using them. It’s a short time to wait for the benefits of keeping the trails in optimal condition. 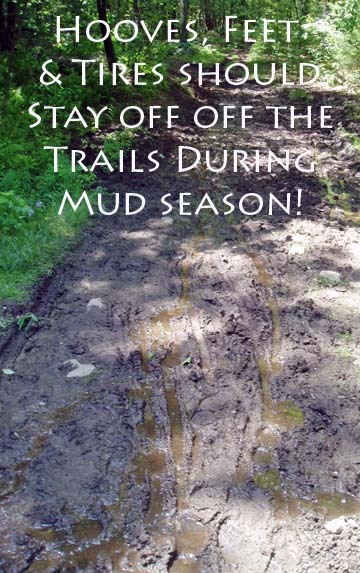 Although mud season generally extends from mid March through mid April, we ask that you please be aware of, and make every effort to avoid muddy areas whenever they exist. We are confident that with your cooperation, the trails will remain in great condition for your use for years to come. The Grafton Land Trust thanks you! Please visit this website for timely updates on trail conditions, as well as trail maps and lots of other helpful information. You can report new muddy areas via the Land Use Committee's Email.